In March 1971, Nolan Bushnell left Ampex to become the chief engineer of Nutting Associates and finally achieve his dream of building a commercial video game. Over the next five or six months, he engineered a game so advanced, it would take at least three years for any other product to approach its combination of representational graphics, physics, and artificial intelligence. 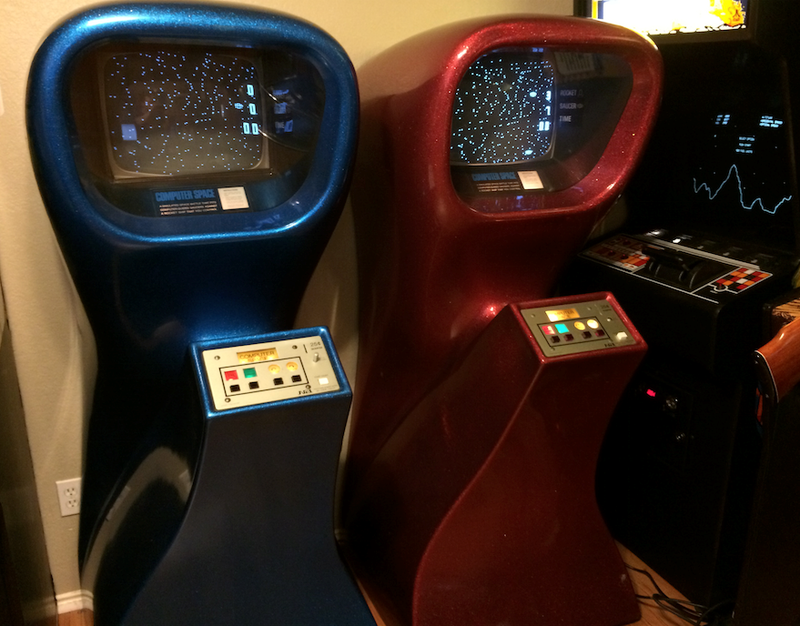 Debuted at the MOA show that October in a sleek fiberglass cabinet, Computer Space conveyed a firm statement that the future was here and the coin-op industry would never be the same. Unfortunately, the game also proved alien to distributors and intimidating to the general public. While the success or lack thereof of Computer Space on the market continues to be a point of debate today, there is no doubt that it failed in its overall goal of igniting the video game revolution. While it sold about as many units as a typical pinball machine, it failed to spark much excitement from the established manufacturers, and Bushnell was forced to return to the drawing board. William Gilbert Nutting was born on May 3, 1926, and grew up in River Forest, Illinois. 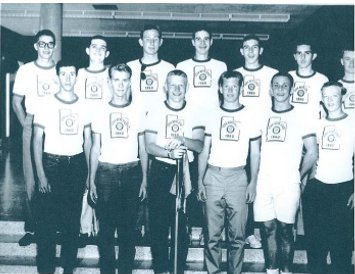 The son and grandson of executives of the Marshal Fields Department Store, Nutting graduated high school in the middle of World War II and entered Army Air Corps cadet training, where he began a life long love affair with flying. According to a profile written in the March 1992 issue of Vintage Airplane, Nutting attended Colgate University for two years after the War and then transferred to Colorado University, where his childhood friend Claire Ullman also attended school. In 1948, Bill and Claire were married, and two years later Bill graduated with a degree in business administration. As stated in a profile in the February 17, 1968, edition of Cash Box, Bill and Claire then relocated to San Francisco, where Bill took a trainee position with the National Motor Bearing Company and then joined Rheem Manufacturing in 1951, where he moved through a variety of jobs from production line foreman to inventory control to purchasing and sales. In 1956, he relocated to Rheem’s Chicago office for a sales and office management position, but in 1959 he returned to California to enter the retail business. According to Goldberg and Vendel in Business is Fun, Nutting’s retail work had him following in his father’s and grandfather’s footsteps by taking a job at the San Francisco luxury department store Raphael Weill & Company — also known as the White House for its beaux-arts facade — where he started as a buyer in the gloves department. Raytheon purchased Edex the next year. According to Claire, Raytheon had no interest in the coin-op business and Bill had long been interested in starting his own company, so he purchased the rights to the machine so he could start marketing it himself. According to the October 23, 1965, edition of Billboard Magazine Bill Nutting marketed the Knowledge Computer through an entity called Nutting Corporation and worked with distributor Advance Automatic Sales to place machines with 20-25 operators in the Bay area. As explained in the February 17, 1968, issue of Cash Box, however, it soon became apparent that the game was too expensive and too hard to service to be a viable product. According to an article by Goldberg in issue 136 of Retro Gamer, in about 1966 Bill therefore contacted his brother Dave, then working as an industrial designer for the celebrated firm Brooks Stevens Design Associates, to ask for help in redesigning the Knowledge Computer. (Note: Dave Nutting’s relatively short, but highly influential career in the coin-op industry necessitates a fuller biography than the scope of this post allows, so his background will be covered in more detail in a later post.) According to Dave as relayed to Goldberg, the brothers agreed that Dave would design and manufacture the game in his home city of Milwaukee, while Bill would concentrate on selling the game from his home in California. According to Dave as relayed to several authors including Goldberg and Donovan and also relayed in interviews with Dave’s partners Harold Montgomery and Gene Wagner conducted by Ethan Johnson, Claire did not like the idea of the brothers going into business together and insisted Bill call the deal off. This may not, however, be entirely accurate. According to a letter written by Bill to his son Craig that was shared with me by Claire Nutting, Dave had wanted to join Bill’s business and redesign the Knowledge Computer, but Bill ultimately turned him down for personal reasons due to a long-standing sibling rivalry. Bill states that Claire was involved in the decision as a member of the board of the company, but that it was ultimately Bill’s decision alone. Dave’s contention that Claire threatened to divorce Bill if he did not call off the arrangement likewise appears unfounded. To redesign the Knowledge Computer, Bill established a new company called Nutting Associates in January 1966, and approached a company called Marketing Services for design help. (Note: some sources claim the company was established in 1968, but the January 1966 date is confirmed by an employee handbook given to me by Claire Nutting that includes a brief history of the company. He incorporated the company in February 1967 according to the company’s articles of incorporation). That company assigned an industrial designer named Richard Ball to the project. According to this author’s interview with Ball, he decided to place Nutting’s unit on test at the College of San Mateo and was amazed when he emptied the machine five days later and discovered it was filled to the brim with dimes. Sensing a hit, Ball subsequently redesigned the game for easier manufacturing, most notably by building a new projector. According to the company employee handbook, Nutting then spent a year placing units on location through a franchise system under the name Computer Quiz before moving to traditional coin-op distribution at the MOA show in 1967. According to Ball, this first version of the game relied on copper relays, which created extreme service headaches. Ball therefore approached a company called Applied Technology to design a circuit board that would accept plug-in relays. The next summer, Ball worked with Applied Technology to redesign the game again to eliminate relays entirely. 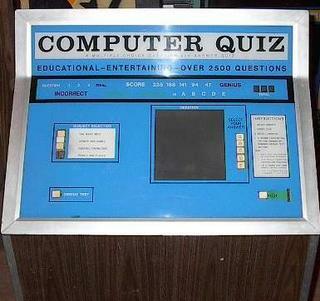 This third generation of Computer Quiz , released according to Cash Box in October 1968, may well have been the first fully solid-state arcade game ever created. Computer Quiz hit the industry at the perfect time. Sega had already proven that operators would be willing to accept a larger, more sophisticated game far different from the traditional pinball table and had also established that the public would accept a machine set for quarter play. Furthermore, the game launched during a period when the industry was still fighting for legitimacy due to the continuing stigma of association with organized crime, so a game with a perceived educational value proved a perfect lead-in product for locations that would not accept pin games or similar amusements. As a result, in a time when the typical pinball game might sell 1,500 units and a hit would only sell around 3,000 both Goldberg and Donovan report that Nutting sold 4,400 units of Computer Quiz, while Nutting Industries sold another 3,600 units of Dave’s version, which he called I.Q. Computer. 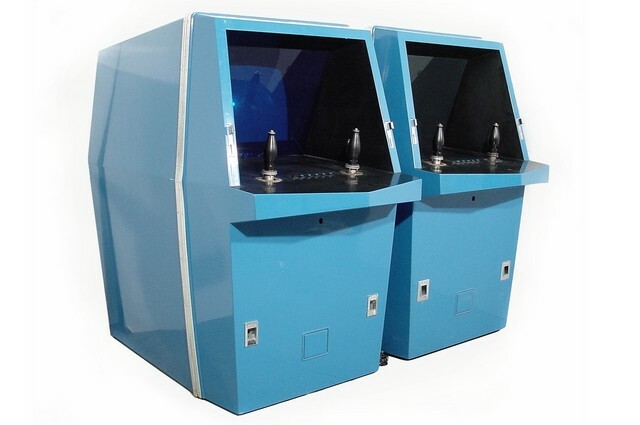 Along with Periscope and Speedway, Computer Quiz played a critical role in the arcade game renaissance of the late 1960s that ultimately resulted in the birth of the video arcade game industry. With White, Ball, and sales executive Lance Hailstone departing, Nutting was forced to refresh his executive staff and hired Rod Geiman to serve as executive vice president and Dave Ralstin to serve as sales manager. According to this author’s interview with Bushnell, before long Nutting himself was spending most of his time tinkering with his planes while Geiman ran Nutting Associates. According to Billboard Magazine, in December 1968 Nutting moved from its 4,500 square foot facility to a much larger 18,500 square foot location as Geiman prepared to expand the company into new markets. The next year, the company launched a sports trivia game called Sports World and a horrorscope machine called Astro Computer, but the company’s main business remained releasing updated questions for Computer Quiz, which could not sustain the company much longer. Therefore, when Nolan Bushnell showed up in early 1971 with his own game idea and agreed to become the chief engineer the company desperately needed, Nutting lept at the chance to hire him. The memory circuit board for Computer Space. Note the diodes laid out in the shape of the spaceships. While there is a great deal of disagreement between Bushnell and Dabney over who did what when building the motion control prototype, there is much less controversy over the creation of the game itself. As described by Goldberg and Vendel, Bushnell’s deal with Nutting was that he would join the company as chief engineer and work on Nutting products during business hours, while working on his video game after hours and on weekends. Bushnell insisted on this arrangement so that Nutting would not acquire shop rights to his video game technology, which remained the property of Syzygy Engineering. When the game was completed, Nutting would manufacture and sell the game and give Syzygy a five percent royalty on each cabinet sold. Dabney, meanwhile, remained at Ampex until the summer, when Bushnell’s progress convinced him they would be able to make a go of it, and he resigned to join Nutting as well. Once work on the game shifted to Nutting, the majority of the engineering was completed by Bushnell. According to Benj Edwards’s article on the development of the game, Bushnell spent his days hunched over a drafting table just outside his office door at Nutting plotting out the circuitry that would tell the spot generator where to place dots on the screen and how they should interact with the player’s controls. He also created the graphics for the game, rendering the player’s ship and the enemy saucers as a series of dots and creating a series of routines that allowed them to rotate smoothly. In one of his more clever feats of engineering, Bushnell used mirroring techniques so that he would only have to store four different ship positions in memory rather than the sixteen needed to cover every possible facing. He also chose to lay out the diodes used for the graphical memory — mask ROM being far too expensive at the time — in the shape of the ships themselves, which allowed operators to easily figure out which diode needed to be replaced in case of malfunction. Finally, Bushnell crafted the AI of the hardware-controlled opponents by dividing the playfield into quadrants and giving the saucers the ability to detect which quadrant the rocket ship was currently in so they would fire in that direction. In one of the rare cases of agreement between Bushnell and Dabney on engineering matters, Dabney concurs that Bushnell completed all the work outlined above, though he does claim that Bushnell came to him for advice on how to implement several features. However, Dabney also claims in his Retro Gamer Roundup interview that Bushnell had help in designing the circuits from Steve Bristow, a young engineer interning at Ampex who later became a key Atari employee. In both an interview in Retro Gamer issue 75 and in a Computer Space retrospective in issue 93, Bristow has confirmed that he did help build the motion control and memory boards used in the game, but in Edwards’s article he concurs with Bushnell that he was not involved in any of the design or layout, just the construction. According to Edwards, Dabney concentrated on the mechanical and analog engineering required to turn the game into a finished product, building a power supply, developing a working coin mechanism, implementing the controls, and constructing a wooden cabinet in which to house the game. According to both Edwards and Retro Gamer 93, he also developed the sound for the game by taking a voltage regulating diode that generated pink noise and attaching an amplifier and integrator that allowed for changes in volume. According to his Retro Gaming Roundup interview, Dabney also came up with the idea of inverting the video every time the player cleared a round to provide a sense of progression. The duo identified the reverse-color screen as “hyperspace.” According to Goldberg and Vendel, Bill Nutting provided the final name for the game, Computer Space — a variation on the name of the company’s first hit, Computer Quiz — while Edwards claims it was Ralstin. According to Goldberg and Vendel, in August 1971 the game was far enough along that Bushnell and Dabney decided to do a location test, an important step in the arcade industry in which a prototype game is placed on location and the coin-drop is measured to see if the game is shaping up to be a hit. (Note: Both Donovan and Retro Gamer place the test in November 1971, but this is clearly far too late: Nutting was already taking orders for the game at the MOA show in October, and location tests always occur before the game is made available to distributors. These sources have apparently confused the location test date with the most commonly claimed general release date.) Dave Ralstin ran a coin route on the side to generate extra income, so Nutting chose to place the game in a bar on the route frequented by students of Stanford University called the Dutch Goose. Packing the prototype unit in Dabney’s Datsun pickup truck, Bushnell and Dabney brought the game to the bar and watched as players flocked to the machine. It looked like the duo had a hit, but a second test at a pizza place did not go nearly so well. Like Spacewar!, Computer Space used a multi-button control scheme and realistically depicted the physics of movement in a zero-g environment — in which an object continues to move in the same direction until a force is exerted in the opposite direction. The Stanford engineering students at the Goose, some of whom were probably Spacewar! veterans, caught on right away. The working class patrons at the pizza place did not. 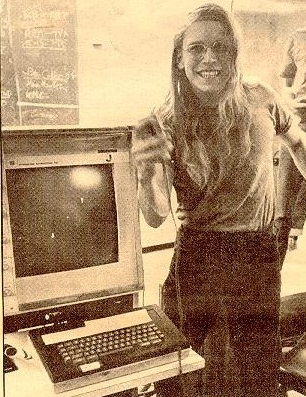 Not long before putting Computer Space out on test, Bushnell learned that he was not the only person working on an arcade adaptation of Spacewar!, though after meeting his competition and observing their work, he decided they were not a threat. According to a testimonial he wrote for the Stanford alumni magazine, Bill Pitts was a Palo Alto native interested in chemistry and physics who matriculated to Stanford University in the Fall of 1964. Pitts quickly signed up for an electrical engineering class and received his formal introduction to computers when an EE professor discovered his interests and helped him push back his “History of Western Civilization” requirement so he could take the brand new “Introduction to Computer Science” course being offered by George Forsythe. According to an interview conducted by coin-op historian Keith Smith for his book All in Color for a Quarter, Pitts ultimately graduated with a degree in statistics, Stanford not having a computer science degree at the time, but he had the opportunity to take high-level courses in computer programming because the statistics department allowed students to take graduate courses as part of their undergraduate degree in an effort to recruit more students to the major. According to Donovan and Smith, Pitts also enjoyed the unusual hobbies of breaking into university buildings and exploring the maze of steam tunnels beneath the campus. As relayed to Donovan, in 1966 Pitts was en route to a bar when he passed a driveway leading off into the hills about five miles from the center of campus. From the sign at the foot of the drive, he could tell it led to a university building, and it was one that he had never broken into before. He returned several hours later with the intent of breaking and entering only to discover all the doors were unlocked. Entering the building, Pitts observed brightly lit rooms and a PDP-6 computer. He had unwittingly just discovered the Stanford Artificial Intelligence Laboratory. Already enamored with computers, Pitts convinced Lester Earnest, the man in charge of overseeing SAIL, to allow him to log computer time when no one else was using the system. Soon, classes were completely forgotten as Pitts began engaging in all night coding sessions. According to Smith, Pitts had already been exposed to Spacewar! on a PDP-1 in Polya Hall before he discovered SAIL, but hanging around the AI lab gave him the opportunity to play it more frequently and share the game with others. As explained by Donovan and the John Markoff book What the Doormouse Said, one person with whom Pitts played the game was his high school buddy Hugh Tuck, whom he would take up to the lab whenever he was back in town from California Polytechnic State University in San Luis Obispo. According to Donovan and Markoff, Tuck remarked one night that if someone could stick a coin slot on the computer, that person could probably become rich. (Note: Donovan claims this exchange took place in 1966, while Markoff claims 1969. In his alumni magazine testimonial, Pitts claims the exchange took place three years before he started working at Lockheed, which would be 1968 if Markoff’s date for his employment is correct. 1968 seems more reasonable than 1969 if only because Pitts graduated in 1968 and may not have been hanging out in the AI lab anymore. Either way, Donovan has probably placed the event too early.) There was no way to package a PDP-6 and a display cheaply enough to create a commercial game, however, so the duo never tried to take the idea any further. In 1971, however, Pitts took a job at Lockheed as a PDP-10 programmer, but had to wait until the computer actually arrived before he could do any work. During this idle time, Pitts noticed that the year before, DEC had released a new computer called the PDP-11. Designed as a successor to the PDP-8 and initiated after the PDP-X debacle and the defection of Ed De Castro to start Data General, the 16-bit PDP-11 occupied roughly the same niche as the Nova and retailed for just $12,000. Pitts thought back to Tuck’s idea to recreate Spacewar! as an arcade game and decided that with a PDP-11 it just might work. From Smith, the hardware Pitts used to create the game consisted of a PDP-11/20 with 8K of memory, a Hewlett Packard 1300A Electrostatic Display, and a point-plotting display interface designed by a man named Ted Panofsky. A coin box was provided by jukebox company Rowe International, while Pitts purchased used B-52 joysticks from San Carlos military surplus store J&H Outlet for use as controllers, commercial joysticks being virtually nonexistent at that time. 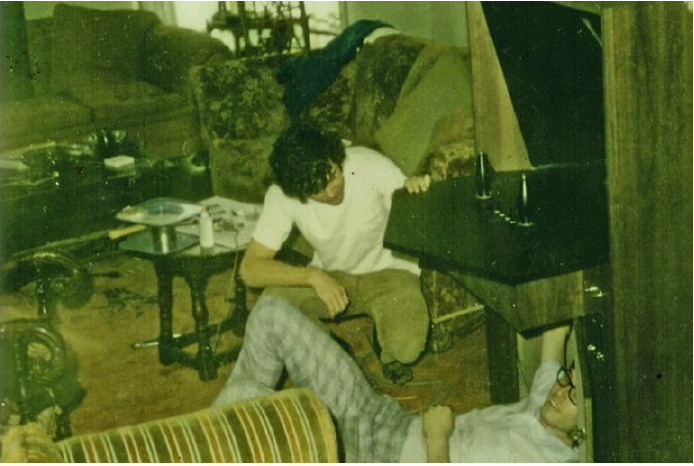 According to Donovan, Pitts assembled this hardware system and programmed the game, while Tuck, a mechanical engineer, designed the cabinet, which was actually engineered by a firm in Palo Alto. Tuck, who came from a wealthy family, also provided the bulk of the $20,000 required to build the machine. According to Donovan, the funding came from Tuck’s parents, but in Pitts’s Stanford testimonial, he says that he, Tuck, and Tuck’s brothers and sisters provided the cash. As the game neared completion, Pitts and Tuck established a company called Computer Recreations, Inc. in June 1971 in anticipation of selling it. Originally called Spacewar! just like the original, Pitts changed the name at the last minute to Galaxy Game due to the profound antiwar sentiment currently pervading area college campuses. According to a business plan written by Pitts and Tuck in early 1972, they installed the first version of Galaxy Game in the Tresidder Union on the Stanford University campus in a music listening room on the second floor in November 1971. The massive walnut cabinet included seats for the player to encourage extended playing sessions and housed the monitor and controls. The PDP-11, meanwhile, resided in the attic and was connected to the cabinet by a 100-foot cable. Unlike Computer Space, Galaxy Game was a faithful recreation of Spacewar! complete with hyperspace and the central sun and even allowed the player to choose whether or not to use the sun, whether to use faster or slower ships and faster or slower torpedoes, and whether or not to allow ships to wrap around to the other side of the screen. Play was set at a dime per game or three games for a quarter. According to Pitts, the game was an instant hit as long lines of eager players waited an hour or more for a chance on the machine. In an email correspondence with historian Marty Goldberg, Pitts said they even briefly installed a second monitor hanging above the cabinet so people in line and other passers by could observe the unfolding action. As Pitts told Smith, the initial version of the game was never meant to be a commercial product due to its cost: its only purpose was to gauge public interest in a Spacewar! arcade game. With the prototype proving a hit, Pitts and Tuck progressed to version two. This version would be placed in a fancier blue fiberglass cabinet, while the computer would drive four monitors instead of just one in order to make the whole system cost effective. These monitors could each run separate games, or they could be linked to allow more than two players to play in the same game. Building the new system ran the cost of the entire project to $60,000. In June 1972, this version was installed in a coffee house in the Tresidder Union, though it had to be cut down to only two monitors to fit into the space allotted by the University. (Note: The June 1972 date reported by Smith comes from a summary of the game’s creation posted by Pitts on a Stanford website in 1997. At the 2013 California Extreme Show, Pitts gives a September 1972 date instead, but as this talk came another sixteen years after the fact, I find this claim less reliable. My guess is he was confusing the installation of the first version, which Pitts has erroneously claimed happened in September 1971, with the installation of version two.) Once version two went live at Stanford, Pitts carted version one to other locations around town, but it never did as well as the installation on campus. According to Pitts’s 1997 testimonial, version two remained in operation until May 1979, when it had to be retired because the display processor had become unreliable. According to Pitts, the game remained popular right up until the end, with clusters of a dozen or more students gathered around the game on any given Friday or Saturday night during the school year. He had long since given up on turning Galaxy Game into a commercial product by then, however, as even running multiple games off a single PDP-11 resulted in a price tag that was simply too high. Nevertheless, Pitts claimed to Smith that by the time Galaxy Game had been retired in 1979, he had recouped the $60,000 cost of developing the game. According to Edwards, Nutting brought four cabinets to the MOA show in an attempt to make it appear the game was already in production, though in truth these were the only four copies of the game in existence. Each game was housed in a different color cabinet — yellow, red, white, and blue. Disaster nearly struck when they discovered the monitors had all broken loose from their cabinets during shipping, but Bushnell and Dabney were able to repair three of the units. The fourth was left open as a display of the internal components of the system, a clever ploy to mask the accident from distributors. How well the game performed at the show is a matter of some debate. In his 1976 deposition, Bushnell claims no orders were taken at the show. When speaking to Edwards in 2011, however, he claimed that distributors felt it would be worthwhile to try the game out, and they came away with a “good order book.” Goldberg and Vendel claim that Nutting took a handful of orders. All sources agree, however, that no one quite knew what to make of the game. In Steve Bloom’s Video Invaders, Bill Nutting claims the game “blew the industry’s mind,” while Goldberg and Vendel emphasize that distributors were skeptical of the game’s reliability and play value while also fearing that hoodlums would steal the TV right out of the cabinet. The game must have generated at least some interest, however, as Goldberg and Vendel report Nutting took Bushnell and Dabney for a flight in one of his planes to celebrate after they returned to California and ordered a respectable production run. According to Smith, Nutting displayed the game one more time at the International Association of Amusement Parks and Attractions show from November 9-12 and then began shipping the game before the end of the year. According to most sources, including Edwards, the game shipped in November, though in his 1974 deposition, Bushnell remembers the game shipping in December, or even in early January 1972. Kent claims in his book that a man named Keith Feinstein acquired documents that prove the game was shipping before the end of 1971, but he does not elaborate. The November 27, 1971, edition of Cash Box magazine contains an ad for the game claiming it is already available from distributors, strongly implying it had already been released by that point, but an article in the December 4 issue states the game is “being readied for U.S. Distribution,” which implies it is still forthcoming. The number of units built also varies depending on who tells the tale. Bushnell stated in Retro Gamer that they produced around 2,200 units, but Nutting claimed to Bloom in Video Invaders that he built just 1,500 units. As this interview came closer to the events in question and the source was the person actually in charge of the company, I tend to believe the lower figure. Either way, this was an ambitious initial manufacturing run in a time when 2,000 units constituted a decent hit. According to Nutting in Video Invaders, Computer Space faced a mixed reception, with some of the more more progressive distributors interested in the game, but most feeling the game held little merit. This claim is backed up by individual anecdotes. For example, Smith reports that Portale Automatic Sales in Los Angeles became the game’s biggest champion and largest distributor, while Donovan reports that Empire Distributing in Chicago, one of the largest distributors in the country, felt video games were a passing fad and had no interest in the game. According to Goldberg and Vendel, Dave Ralstin overcame some initial skepticism by giving away the first five machines off the assembly line to five of the largest distributors in the country. The ploy must have worked, for Goldberg and Vendel report that by spring 1972 the game had sold 1,000 units. Both Bushnell and Dabney have claimed in separate interviews, however, that with the game starting to become successful and Ralstin earning a nice commission on each unit, Nutting decided to dismiss him and sell the game himself. According to Goldberg and Vendel, sales dropped off quickly after that. This story may not be strictly true, however. While sourcing on Nutting Associates is difficult to come by, the May 13, 1972, issue of Cash Box identifies Ralstin as still being the sales manager at Nutting. While its still certainly possible that Ralstin was dismissed because Nutting felt his commission was too large and his services were not needed, I imagine that Computer Space sales were probably largely complete by that point anyway and that his dismissal therefore had little effect on the fortunes of the game. On the other hand, Bob Portale praises sales of Computer Space in the same issue, so its possible that the game was still selling, at least in some parts of the country. Final sales figures for Computer Space are not known. Bushnell stated to Retro Gamer that he believed they sold 2,200 units, which seems high, but in his 1976 deposition, he placed the number at between 1,300 and 1,500 units. Goldberg and Vendel claim 1,500 units as well, while Edwards claims between 500 and 1,000 units, which is almost certainly too low. Kent claims Nutting built 1,500 units but failed to sell them all. Considering Nutting’s claim of a 1,500 production run and some difficulty enticing distributors to buy the game, Bushnell’s 1976 estimate of 1,300 to 1,500 units appears to be the most accurate. So was Computer Space a success? That is a difficult question to answer. As Donovan points out, sales of 1,500 units were nothing to be ashamed of in the early 1970s, and Bushnell has claimed in several interviews that the game grossed $3 million, though this figure is probably a little high. According to Edwards, Dabney remembers being disappointed by the game’s performance, yet Bushnell remembers it as a modest success, though one he felt could have been bigger. In his memoir Lucky That Way, former Activision producer Brad Fregger recalls being hired by his friend Rod Geiman to collect coins along Nutting’s game route and being impressed by how many quarters Computer Space took in. Nutting must not have been too disappointed with the game’s performance either, as he ultimately negotiated with Bushnell to create a two-player version of the game, and a flop does not get a sequel. On the other hand, the game only sold modestly well and failed to excite most distributors. Nutting claims to Bloom that he had to “force” some companies to take the game, while Kent states he could not sell the whole production run. Also, while 1,300 to 1,500 units was not a bad showing for the period, it paled in comparison to the biggest hits of the day like Speedway and Nutting’s own Computer Quiz. According to Bushnell as told to authors from Kent to Edwards, working-class bar patrons, one of the coin-op industry’s most important demographics in those days, were unable to grasp the complex controls and realistic physics and soon tired of the game. Furthermore, in an industry where a hit product was guaranteed to be knocked off a dozen times over, only one other company, a small Burbank firm called For Play Manufacturing, ever created a Computer Space clone, while the big manufacturers in Chicago could not be bothered to adopt video technology at all. Therefore, while Computer Space did not really perform poorly, it failed to interest the industry or the public in pursuing video games further. Despite the mixed reception for Computer Space, Nolan Bushnell remained convinced that the future of popular entertainment lay with the video game. He therefore resolved to move forward with new products, either in partnership with Nutting or through an agreement with one of the big Chicago firms. Bushnell realized, however, that he would need a more accessible game for his next project. While Bushnell mulled his next step, Nutting learned in May 1972 that yet another group was attempting to create a video game, so once again Bushnell decided to scout out the competition. Unlike Pitts and Tuck, however, this group was not looking to create an arcade cabinet; they were preparing to bring video games into the home. In the summer of 1970, Nolan Bushnell, Ted Dabney, and Larry Bryan prepared to change the world. With a vague plan, virtually no funding, and a partnership that consisted of a name and little else the trio began an ambitious project to turn Spacewar! into a commercial product that could entertain teenagers and adults at fun spots and arcades. Unsurprisingly, virtually nothing went according to plan. Nevertheless, after months of prototyping, redesigning, and compromising Bushnell believed he finally had his game by the beginning of 1971 before he realized he had made a crucial calculation error and that a minicomputer would not run his game economically after all. Bushnell’s dreams could have died right then, but in a eureka moment, the budding entrepreneur realized that he and Dabney — Bryan having been abandoned long since — had built such versatile TTL circuitry that a computer was not really needed at all. After a quick redesign and a fortuitous encounter with one of the only American arcade game manufacturers outside of Chicago, Bushnell’s game, ultimately dubbed Computer Space, was well on its way to entering production. Despite being a relatively simple game created by just two people over a period of just a few months, there are few games with as controversial and convoluted a history as Computer Space. This is because for decades the only account of the game’s creation came from Nolan Bushnell. When Ted Dabney emerged forty years after the fact to pass along his memories of the game’s creation, a completely different story emerged, one which Bushnell continues to vehemently deny. As with most controversies involving credit and responsibility, the truth probably lies somewhere in between. In this post, I hope to reconcile these stories as best as I can under the circumstances. In the summer of 1970, the informal Syzygy partnership began its project to recreate Spacewar! as a coin-operated game, with Bushnell handling the electronic engineering, Dabney focusing on video engineering, and Bryan handling software. The first important task was choosing which computer to use to play the game. Bushnell has stated in many interviews that it was a sales flyer for the Data General Nova that first sparked his interest in recreating the game for the arcade, but the trio still surveyed the minicomptuer market carefully to make sure that they settled on the cheapest computer with enough processing power handle the job. According to Bushnell’s 1976 deposition, sometime around August 1970 the trio acquired a catalog comparing the prices and features of all the minicomputers on the market. After studying these listings, the trio decided the Nova was indeed the proper computer for the task. According to Bushnell’s deposition, Bryan began work on the computer program even before the choice of computer was finalized, placing this work in mid-Summer 1970. This also lines up well with Bryan’s recollection that he did his work about six months before Bushnell approached Nutting Associates to manufacture the game. According to Goldberg’s interview with Bryan, the programmer spent a couple of weeks tinkering with the program in his spare time before deciding that there was no way they would ever be able to get a Nova computer to play four to six games of Spacewar! at a decent speed. Bryan delivered these preliminary results to his partners and then passed into history. Based on his deposition, Bushnell appears to have continued working on the minicomputer problem for several more months, so he would have probably brought Bryan back into the loop if they had moved forward with that plan, but it was not to be. Indeed, Bryan must have continued to be on Bushnell’s mind for some time after the summer, for according to Dabney in his Computer History Museum oral history when it came time to formalize the Syzygy partnership, Bushnell brought up Bryan, and Dabney responded that since he never paid in his $100 (which, of course, Bryan maintains that he was never asked to do), Bryan was out of the group. What happened next depends on whom you ask. In Donovan’s Replay, Bushnell described a process of whittling down the computer program by transferring more and more functionality like the background star field and gravity to specialized TTL hardware in an effort to salvage the project. According to Donovan, this work was unsuccessful, and by Thanksgiving the project was dead. Dabney, on the other hand, has claimed in interviews that work halted completely when a computer program did not appear feasible and did not start up again until one day, out of the blue, Bushnell asked him if it would be possible to control the movement of the spaceships on the television screen using a pure hardware solution. Based on Nolan Bushnell’s deposition and the accompanying evidentiary exhibits, it appears that Bushnell’s account to Donovan, while not entirely accurate, is closer to the truth than Dabney’s. From Dabney’s interviews, however, it appears that Bushnell was doing a lot of brainstorming without Dabney and only periodically keeping him in the loop, so it may be Dabney was simply unaware at the time of the effort being put into the project. Bushnell’s deposition demonstrates that work continued on a computer-based system through at least January 1971, contradicting his recollections to Donovan that the project was dead by Thanksgiving. The January date is set by one of the few pieces of documentary evidence from the period: a letter from Nolan Bushnell to Data General salesman Bob Washburn dated January 26, 1971, in which Bushnell states his intent to order several Data General Nova computers. In his deposition, Bushnell explained that by this point the basic system for the game had been sketched out, and he now needed some actual computers to make sure it worked. Schematics provided by Bushnell at the deposition also prove that several portions of an interface between the Nova and a television had been designed by this point, demonstrating that work had continued on the project above and beyond what Bryan had contributed to the software. According to Bushnell’s deposition, the minicomputer project only died sometime between January 26 and a followup letter from Bob Washburn dated February 16, 1971, that was also entered into evidence. According to Bushnell, he initially believed he had solved the timing problems from Bryan’s initial designs (most likely through moving some functions to specialized hardware as he claimed to Donovan since he was not a programmer and could therefore not alter Bryan’s code too much) and was looking to get some time on a local Nova computer to do a final pass on the system. At that point, a person at the facility to which Bushnell was attempting to gain access pointed out a flaw in Bushnell’s calculations, thereby illustrating that a computer would not work after all. At this point, Bushnell had a eureka moment and decided to do the entire game with custom-built hardware. Perhaps the biggest bone of contention between Bushnell and Dabney is the creation of the spot generating and motion circuitry that proved critical to abandoning the minicomputer in favor of a custom hardware solution. In his oral history and Retro Gaming Roundup interview, Dabney claims Bushnell came to him one day and asked him why adjusting the vertical hold on a television caused the screen to move back and forth and whether they could do something similar to move their spaceships across the screen. Dabney said this should be possible, so Bushnell asked him to build a system to do so. Dabney then set up a makeshift lab in his daughter’s bedroom to create the prototype. 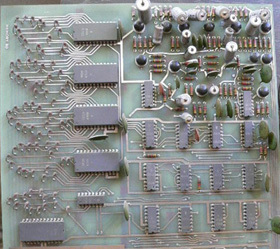 When it was finished, Bushnell took the circuit board with him and secured a contract to make a game based around this hardware. Bushnell has vehemently denied this version of events on several occasions, including an interview with this author. According to Bushnell, he would have never needed to ask Dabney how a television worked because he had been repairing them for years. Also, he maintains that all of the digital engineering on the project was done by himself alone, and that Dabney was only involved in analog work like a monitor interface and power supply. Furthermore, he has stated to numerous authors over the years, including Kent and Donovan, that he was the one who set up a lab in his daughter’s bedroom to make the game. This dispute between the partners is not easy to unravel. First of all, there is one area where Dabney appears to be mistaken: Bushnell likely never came to him to build a spot generating and motion system to replace a computer. The January 26, 1971, letter clearly demonstrates that Bushnell was still working on a computer system after the motion circuitry had been developed, so there was no need at the time to do an end run around the Nova. In his deposition, Bushnell explains that the motion circuit board was an “exercisor,” that is a system built to simulate the actual computer that would ultimately be used. According to Bushnell, they built this exercisor so they could make sure their other hardware was working properly. If they just tested everything directly with the Nova, they would not be able to tell if any problems stemmed from the hardware or the computer software. According to Bushnell, it was only after he learned in late January or early February 1971 that a Nova would definitely not work that he hit on the idea of using the already existing motion circuitry in its place. On the other hand, it appears that Bushnell’s long-held contention that the early game hardware was built in his daughter’s bedroom is probably a myth. In his oral history, Dabney states the hardware was built in his daughter’s bedroom, and interviews conducted with Dabney’s daughter by Marty Goldberg and Curt Vendel for their Atari history book appear to corroborate Dabney’s recollections. Even Bushnell admitted in a Retro Gamer article on the making of Computer Space that at least some of the work was done at Dabney’s house. Of course, Bushnell also reconfirmed in that interview that he did work in his daughter’s bedroom as well. Dabney counters that Bushnell’s wife would have never let him bring so much as a soldering iron into their house. Admittedly, in this case we only have Dabney’s word versus Bushnell’s recollections, so the only evidence we have to go on is the character of the individuals involved. In the 1970s, Bushnell often took full credit for creating both Computer Space and Pong, which we now know is not true. Furthermore, he has always claimed that he first saw Spacewar! at the University of Utah, which is also probably not true. Dabney, on the other hand, never sought the limelight, never sought to take credit for any accomplishments, and only told his side of the story forty years later after he was tracked down by historians. While this does not automatically render him free of any agenda, it does mean that he is not likely letting a need for self promotion cloud his recollection of events. Therefore, I conclude, like Goldberg and Vendel in their book, that the preliminary work was done at Dabney’s house, not Bushnell’s. This leaves open the question of who should get the credit for creating the motion circuit board. This is a question that will probably never be answered. Dabney’s contention that Bushnell had no idea how the vertical control on a television works seems a bit suspect, as he did do TV repair work in high school and college. Even if he was just “switching tubes around” and did not have the knowledge or skill to do sophisticated repairs, I find it highly unlikely that an individual as insatiably curious as Bushnell with an electrical engineering background and direct experience working with televisions would not have any inkling as to how they worked. Its also worth noting that in his 1976 deposition, he describes how the motion control hardware works and displays an impressive command of the entire system. Granted, this deposition was conducted years later, so he had plenty of time to refine his knowledge of the technology, but he did very little engineering work after creating Computer Space, so its hard to imagine that he gained most of this knowledge after the fact. Therefore, Bushnell’s deposition shows that at the very least he was capable of understanding the engineering behind the hardware even if he did not create it himself. 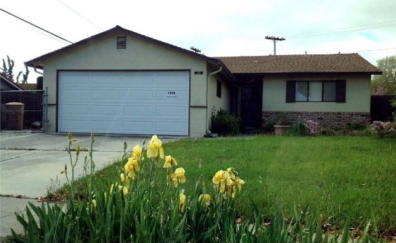 On the other hand, if Dabney’s house was the primary staging area for building the motion circuitry, it would make sense that Dabney led the effort to design it. Dabney was also the more experienced engineer when it came to working with video circuitry, having spent most of his career at Ampex doing just that. Therefore, while I am not convinced Bushnell was as ignorant as Dabney claims, I do think Dabney must have taken the lead in developing the motion control board. A potential smoking gun appears in Bushnell’s 1976 deposition in the form of a drawing entered into evidence that is dated January 26, 1971, entitled “Position and Line Counter Cosmic Combat” that is marked “drawn by S.F. Dabney.” If Dabney is the one drawing the schematics portions of the spot generating hardware, he is probably also the one designing it. Regardless of who built it, however, both engineers agree that the motion control board was Bushnell’s idea. Whether built primarily by Bushnell or Dabney, by early 1971 the partners had completed a motion control circuit board that could hook into a television or monitor and generate a dot on the screen that could be moved around by flicking toggle switches on the hardware. According to an interview conducted with Bushnell by Kent for The Ultimate History of Video Games, the parts for this system came primarily from Ampex, which allowed employees to take small numbers of cheap components for personal projects, and Marshall Electronics, where Bushnell knew salesmen that were happy to provide free samples in return for a promise of an order if the project ever came to fruition. According to Kent, a used television purchased at Goodwill completed the system. By early 1971, Bushnell and Dabney also finally had a real company. While they had been working under the Syzygy name since at least the summer of 1970, they had never done any work to formalize the relationship other than a vague promise to contribute $100 each that was apparently not even conveyed to one of the partners. In either December 1970 (according to a prospectus prepared by Atari in 1975) or January 1971 (according to Atari’s FY 1973 financial statement) Syzygy Company was formally organized as a partnership between Nolan Bushnell and Ted Dabney. The catalyst for this event was most likely the impending order of computers from Data General, as Bushnell would have definitely wanted to present a real business entity to such an important supplier. In nearly every account of the founding of Syzygy/Atari from Cohen to Kent to Donovan, Bushnell and Dabney are said to have contributed $250 each to start the company, though all of these authors have confused the timeline. Kent, in one of his more egregious errors, states that Bushnell, Dabney, and Bryan came together to found Atari in June 1972 by each agreeing to chip in $250, conflating the founding of Syzygy in 1970 with the incorporation of Atari two years later. Cohen meanwhile, correctly states that Bushnell, Dabney, and Bryan were all supposed to chip in $100 to create a partnership, but goes on to say that after Bryan pulled out, the other two upped their contributions to $250. Like Kent, he places these events at the incorporation of Atari in 1972 rather than in 1970-71. Even Donovan, generally accurate in his recounting of video game history, places these $250 contributions at the founding of Atari in 1972. A look at Syzygy’s financial statement for the year ending December 31, 1971 and Syzygy’s balance sheet dated June 30, 1972, shows that none of this is accurate. First of all, the contributions were definitely made at the start of the Syzygy partnership and not at the incorporation of Atari, because the 1972 balance sheet shows that the company controlled cash in excess of $6,000 at that time (derived from several income sources that will be discussed in a later post). The 1971 balance sheet further proves that the ownership contributions were made during that fiscal year, though it records $350 from each partner rather than $250. As discussed previously, this has led Goldberg and Vendel to claim in their history that the initial contributions for the company were $350 each. Most likely, Bushnell and Dabney contributed $100 soon after the informal partnership came into being in summer 1970, as stated by Dabney and implied by Cohen, and then added another $250 each when they formally organized the company at the end of 1970. This would explain why most accounts say the initial owner contributions were $250 without contradicting the balance sheet that shows $350 in ownership contributions by the end of 1971. With a company and a prototype system in hand, Bushnell and Dabney now turned their attention to raising the money needed to make their arcade game a reality. According to Goldberg and Vendel in Business is Fun, the duo first tried to interest Ampex in the project through their boss, Ed De Benedetti, but he turned them down. Next, Dabney turned to one of his mentors, a former engineer in the Ampex Military Products Division named Irving Roth, but he turned them down as well. Unsure where to turn next, Bushnell made a fortuitous connection through his dentist. According to an interview excerpt in High Score!, Bushnell was discussing his project during a dental appointment and learned that another patient worked at a local coin-op manufacturer called Nutting Associates. According to both Benj Edwards’s article on the creation of Computer Space and Business is Fun (in both of which it must be noted all dates related to Computer Space are off by one year due to faulty recollections of the timeline by Dabney), this dentist appointment took place in February. Bushnell contacted Nutting, and two days later presented his pitch to create a video arcade game for the company. By March, Bushnell had resigned from Ampex and joined Nutting, where he prepared to unleash the first commercial video game on the world.